New technologies in telephony bring advancement in communications which in turn influence changes in business from large-sized enterprises to small ones. However, traditional imperatives in the SOHO telephony market stand fast asking for values like cost effectiveness, easy operation and maintenance at the forefront. ARIA SOHO is a latest offering, delivered on Ericsson-LG’s digital technologies, to address the needs of communications in small and medium-sized enterprises and homes. ARIA SOHO is designed to be a user manageable telephone system regarding installation and ongoing operation and maintenance. With Plug & Play facility thru a full-hybrid architecture, the ARIA SOHO gives a maximum flexibility in selecting types of user terminals whether dealing with Analog SLT, FAX or Digital phone. 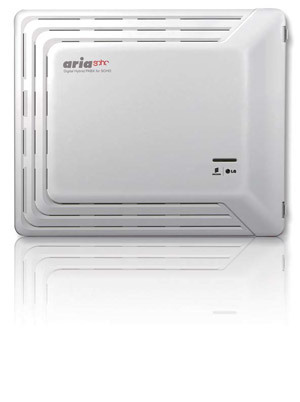 When connecting external lines, ARIA SOHO recognizes varying signals identifying FAX from voice and automatically delivering them to the appropriate types of terminals. This facility is ideal to satisfy the needs of small to medium-sized enterprises as well as home users with little-to-no engineering background. Services to monitor and restrict outgoing traffic (as needed) in order for a manager to control communications costs. Easy hands-on methods for maintenance and operation as PC-Admin software and Speed Editor for updating the user database.